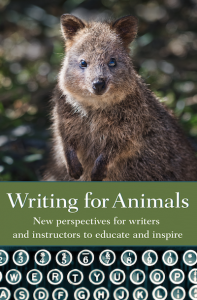 Rosemary Lombard’s essay “A Case for More Reality in Writing for Animals” appears in Writing for Animals. Q: In what ways has your writing changed as your knowledge and awareness has evolved? A: That is a long story with many bends. In grad school, except for a single nonfiction course, I was schooled in academic writing in musicology, a discipline far from animal interests. Only when a female box turtle, Diode, joined my pet male did I begin to write about animals. The description of her first days was as precise as I could make it, but I still had a few courses to take and classes to teach and soon dropped the writing. Yet the behaviors of those first turtles, not at all what I expected from reptiles, fascinated me far more than the dissertation staring me in the face; so, after courses were done, I started teaching in Chicago universities and, instead of the dissertation, began my own self-education about herpetology, animal behavior, and interspecies communication. Eight years after Diode came, I started writing again. She surprised me — amazed me! She had apparently planned a charade to show she understood the concept of classifying objects, and she followed it up by demonstrating that she understood the meaning of a few spoken words. I was hooked. An exploratory collaboration with Diode and three others began, and, with games and choices, they learned quickly and with high motivation. Daily I wrote about what was happening. Those descriptive journal entries, volumes of them from 1979 to the present, were my writing teachers. Again, precision and clarity about behaviors were paramount — both in content and syntax. They were data but written as gracefully as I could. Then I decided to take courses to fill in my self-education: many courses in biology, natural history, animal behavior, and communication, from Bio 101 back to another grad school, with plenty of writing. 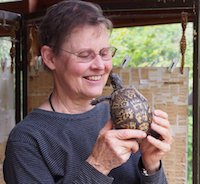 A monograph came out of a Stanford linguistics course; then a book about the turtle research began to form, and eventually, when I decided on my trade book audience, I wrote many chapters based on the journals, now my external memory. The next step began with two poetry workshops at a conference and, finally back in the Northwest, a month of memorial birthday readings honoring my old prof William Stafford. Suddenly, poetry was in my ear, and as I became a poet and wide reader in poetry and prose, I found literary skills that could enrich my prose writing. Now I write both poetry and creative nonfiction with the goal to build more respect and empathy for turtles and other animals, especially as related to my concern about wild animal trafficking and the pet trade. Still, I keep working to notice more as an animal observer and reader-become-writer — I taught several classes on sketching from nature partly to discipline myself to notice details and behaviors — and I participate in writing workshops as well as offering lectures and lecture-demonstrations. Diode and the now thirteen others, mostly second generation, still inspire me. Learning just keeps going. Q: What is the most important thing you feel writers should keep in mind as they write about animals? A: My belief is that writers should attempt to learn enough about the real animals and their places and ways of life in order to acquire and select genuine characteristics and actions as a basis for creating believable characters, whether they’re walking or flying or swimming in the real world or, with added imaginings, in a world of their own. Elena Passarello, in her Oregon Book Award winner Animals Strike Curious Poses, writes about famed sixteenth-century artist Albrecht Dürer and the photographic precision of his work, such as “the thousand-fold strands of watercolor fur on his Young Hare.” He admonished others to do the same, writing, “Don’t diverge from nature in your imaginings, thinking you want to find things for yourself.” Yet he could — and did — take details from life and produce wildly imaginative work. Yes, the details in our art too can transfer to fantasy and other styles. Good writing about animals can be engaging and informative and go part of the way toward bringing an audience to take steps toward protecting them. However — and here is the bottom line — those of us who are intense about issues that benefit animals have another step available. Our writing, not only in nonfiction, needs — along with our empathy and skillful storytelling — enough reality that readers can respect and empathize with the characters and then be able to make the emotional transition to the real animals that need the readers’ help. As many have pointed out, we save what we love. Q: Which authors/books do you feel do a good job of realistically and compassionately portraying the lives of animals? A: A catalog of books about animals would be daunting, and even my bookshelves are groaning. I’ll note a few that are both realistic and compassionate and have additional features worth study for the writer. First, let’s consider a book, still beloved, from the mid-twentieth century, Nobelist Konrad Lorenz’s King Solomon’s Ring. The editors of the Time edition assigned to him qualities we’re looking for: “Every chapter of King Solomon’s Ring is enriched by the fruits of affectionate looking and hard reasoning.” And the author adds the necessity for real facts; he says, ” … I shall not aspire, in this little book, to improve on nature by taking any artistic liberties” — but we must say, not to the exclusion of charm. We must add his personal involvement in the stories of his investigations. Who could forget his account of the thickening naturalist — Konrad himself— “squatting and quacking” for hours on end through the meadow, followed by his adopted string of ducklings as he famously learns the details of imprinting on the “mother,” starting with the first quack they hear (and its continual instruction to follow the mom, whoever she or he may be). A modern book I have recommended to many is University of Washington researcher John Marzluff’s Gifts of the Crow: How Perception, Emotion, and Thought Allow Smart birds to Behave Like Humans, which includes fascinating accounts of research with wild-flying corvids and, a valuable bonus for some readers, elementary neurosci tech talk about the structure of the bird brain and how that structure has parts that are arranged differently from ours but has corresponding actions. For perceptive and affectionate books by naturalists who lived with or worked closely with the animals described, I recommend Esther Woolfson’s Corvus: A Life with Birds; Benjamin Kilham’s straightforward accounts of raising orphan bears on his wild land and his discoveries about bear behavior; and Julie Zickefoose’s Letters from Eden: A Year at Home, in the Woods. I’ll let Merle’s Door: Lessons from a Freethinking Dog, by Ted Kerasote, represent the yowling multitude of dog books. I discuss it in my essay, pointing out that, though he translates the behaviors of the dog to language, that translation is based on keen observation of those behaviors and a close relationship with the independent Merle. Notable anthologies of short animal pieces include those from Ashland Creek Press, Creative Nonfiction magazine, and Orion magazine. In the latter, Animals and People: A Selection of Essays from Orion Magazine, I point out and, further, suggest books by contributors Jane Goodall, David Gessner, Brian Doyle, Mary Oliver (her ecstatic poetry), and Craig Childs: such intense lovers of animals! In The Animal Dialogues: Uncommon Encounters in the Wild, Childs takes us skillfully on adventures with wild animals in ways armchair naturalists and writers would never venture. Charles Finn, in Wild Delicate Seconds: 29 Wildlife Encounters, provides a set of delightful miniatures: richly described, sometimes funny, always memorable. Finally, I want to comment on a new book, so new that, so far, I’ve read only the sample provided online. What I read, though, does a fine job of pulling the sensibilities and skills illuminating all these books together into a package so appealing to the general reader that it has risen to best-seller status, a far-off star in the minds of the rest of us. The buzz is about Buzz, which is about bees. Author Thor Hanson (Feathers) uses all the techniques of creative nonfiction, including lively, conversational language; first person involved; informal and informational chats with experts, visits to sites, historical background; and the care with language and diction of fine fiction. His own powers of observation and scientific background show on the page, as well as the fascination and love he has for animals, clearly including the bees. Animal behaviorist/writer Rosemary Douglas Lombard enjoyed roles as biomedical librarian, naturalist, and university teacher but cherishes decades exploring turtles’ cognitive potential. She won firsts in nonfiction and poetry and published in Bay Nature and Verseweavers, among others. Writings include Turtles All the Way (Finishing Line Press) and WIP Diode’s Experiment. You can find Rosemary online at https://ChelonianConnection.blogspot.com.